It was a very cold Winter, Spring of 2018 arrived 10 days later. With the blessing of lovely warm weather for the last couple of weeks, our early apple Gingergold is flowering. 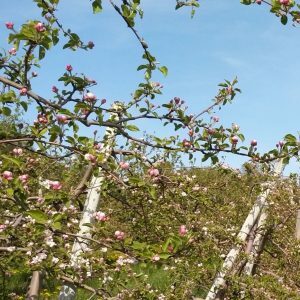 All apple trees are expected to be in full blossom in the coming weekend. 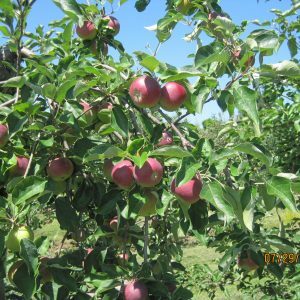 Pieter's Appleyard will be open Saturday 05/26/2018 from 12:00PM to 3:00PM for everyone. 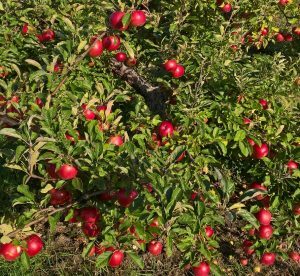 Admission is free, come and enjoy beautiful blossoms of our apples. 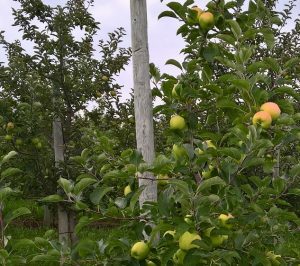 2017 season started with wet and relatively cold weather, which had added difficulty on apple crop management. 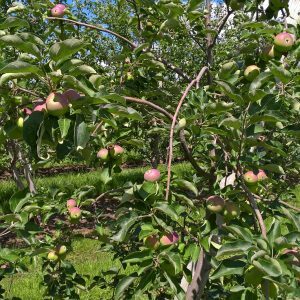 After a very drought weather condition in 2016, our apples are stressed across all cultivars. Luckily, with hard work from all our staff and precise crop management, we still come out with a reasonable harvest season. A great news to our customers, we just received our 2017 report from OMAFRA , all test results are far below the limit. 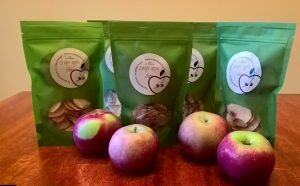 Our customers can enjoy our excellent tasting apples with a peace of mind. Now 2017 season is closed, we thank all your support for your local farm! 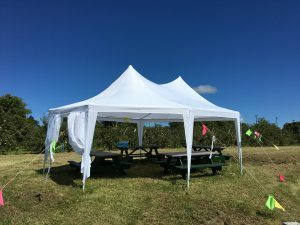 To enhance our patron’s overall comfort and experience, we have added a party tent for our upcoming harvest season. The tent overlooks the beautiful Lake Ontario while patrons may sit comfortably in a shaded area to relax and enjoy the cool breeze blowing in from the waterfront. A reservation for the picnic table is required. The first hour is free of charge and a fee of $10.00 per hour per picnic table is required beyond the first hour (subject to availability). Please email info@pietersappleyard.com to book your reservation and for any other inquiries. 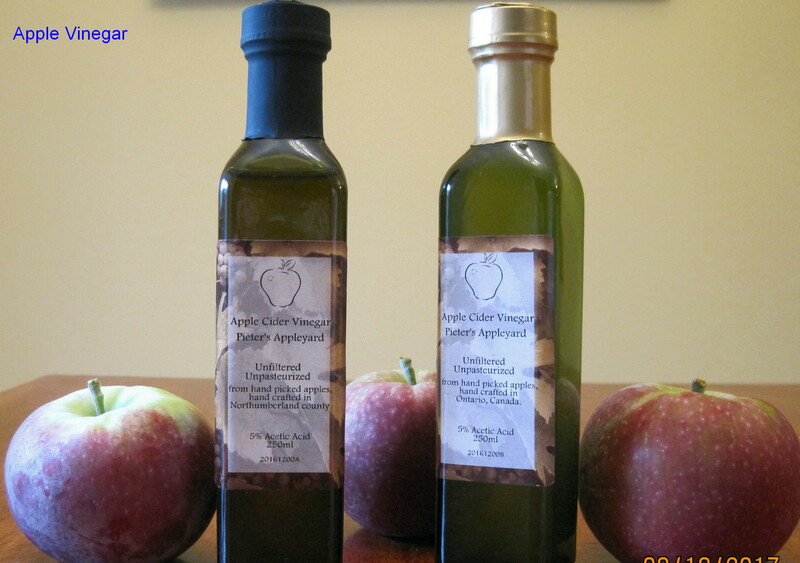 With much anticipation, our 100% blended apple cider vinegar is finally available in our store. 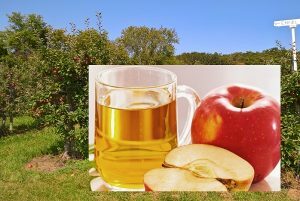 Our apple cider vinegar only has one single ingredient: raw, unfiltered, unpasteurized apple cider. With nature's helpful yeast, fruit sugar turns into alcohol, which is done through the process of fermentation. The beneficial bacteria, also known as "probiotics"-turns the alcohol into acetic acid. That's why cider vinegar tastes sour and has a pungent smell. 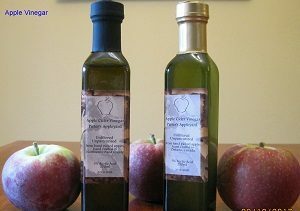 Our vinegar has been eight month in the making. Our raw, unpasteurized apple cider vinegar still contains parts of the "mother", stringy mass of yeast and live bacteria left over from fermentation process. Apple cider vinegar possesses amazing health benefits. 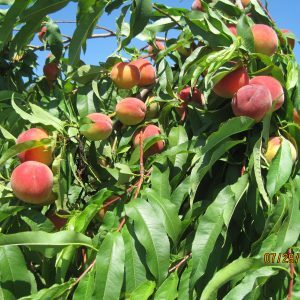 Usually at this time of the year, early red haven peaches have finished its production. 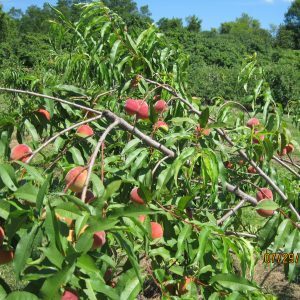 2017 has brought us a cooler summer, which grants us one more week of the peach season. The last batch of early red haven will still be available to be picked this week. On the other hand, the red haven peaches will be ready for the our customers in couple weeks. Yellow transparent apple is surprisingly popular, for they were sold out before they were all picked off the trees. Silken and Paula-Red are looking very well, they will be available in our store in a couple of weeks. Stay tuned for our harvest updates! Rain has been a descriptive word for this summer. To do our part for the environment, we collect rain for our trees every year. This year, the water truck ( 1,000 litters ) is often overfilled with one rain fall while it usually takes a week or two in previous years. 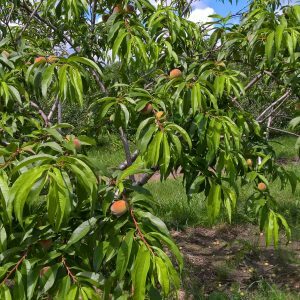 With Jesse's painstaking care and effort, our peaches still are coming along nicely, will be ready to celebrate our Civic Holiday long weekend. With warmer weather forecast this coming week, you should be pleased to see how much these peaches will size up. 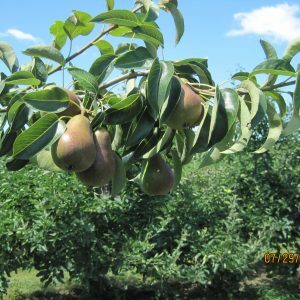 Apple and Pear are also ready for market in the Mid August, thanks to Jesse's persevering effort. After 7 year since planted, our cheery trees are starting to produce fruits this year . 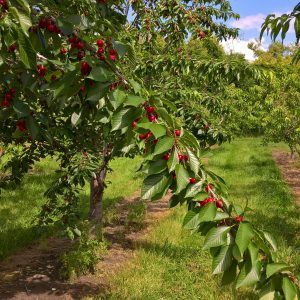 Even Our cherry trees have never been sprayed, they are bearing plenty of sweet, juicy and healthy cherries. 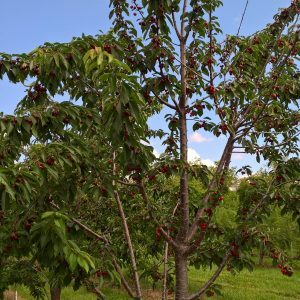 We had some cherries on the young trees in previous years, but they hadn't consistently yielded much fruits. Now our clients could reasonably expect the trees to bring them some sweet and juicy fruits in many years to come! 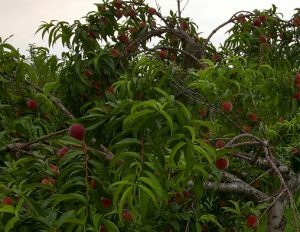 Peach is a promising year for 2017 after almost no fruit in drought 2016.